FINAL SALE. This otherwise simple black cotton maxi dress is amped up with unexpected touches. The Black Maxi Dress With Mesh Waistband and Elastic Straps is made of an relaxed cotton fabric that is perfect for summer. It has a V neckline with a cutout in the center made of black mesh fabric. The thick empire waistband is crafted entirely of sheer black mesh fabric. We also love the thick adjustable spaghetti straps made of elastic. This stylish dress would look great paired over a fitted striped spaghetti strap tank or worn alone. You could pair this dress with black flats for a casual look—or dress it up a bit with wedges. Details: Unlined. Adjustable spaghetti straps. 95% rayon, 5% spandex. Hand wash cold water separately. Color will bleed. No bleach. Hang to dry. Small measurements: Length from top of shoulder to hemline: 60”. Bust: 30”. You have added Black Maxi Dress With Mesh Waistband and Elastic Straps into Wishlist. 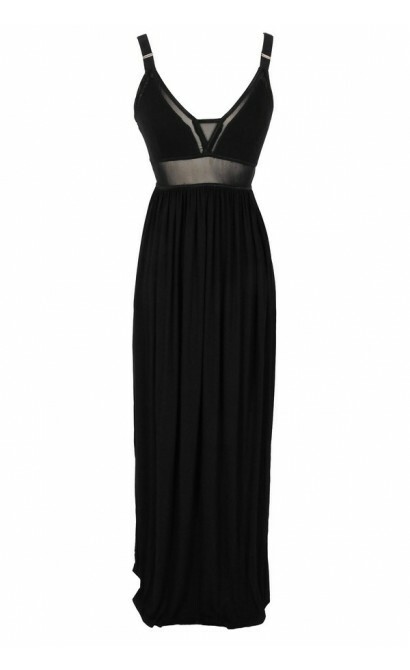 You have added Black Maxi Dress With Mesh Waistband and Elastic Straps for Stock Notification. 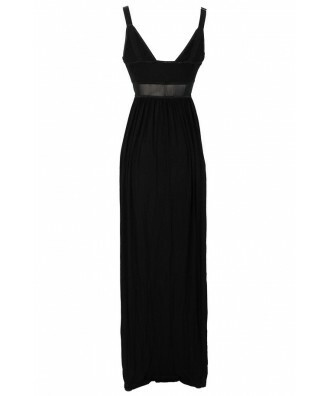 You have set Black Maxi Dress With Mesh Waistband and Elastic Straps as a loved product. You have removed Black Maxi Dress With Mesh Waistband and Elastic Straps as a loved product.